Among the many hazards at a building site is the presence of heavy construction equipment — including backhoes, bulldozers, cranes, and front-end loaders. But other types of equipment also may pose dangers, such as scaffolding, ladders, power tools, and personal safety gear. 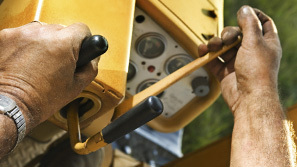 Regardless of its size or function, construction equipment must be operated and maintained properly to ensure the safety of workers and passers-by. When someone is killed or injured by construction equipment because of negligent operation or maintenance, The Law Offices of Frank L. Branson have the experience and resources to help an injured party or family in evaluating who is responsible for their loved one’s injury or death. Our attorneys call on their experience and expertise in these cases to determine who should be held responsible — the general contractor, a subcontractor, or another party. We can investigate the circumstances of your accident and help sort our whether there is a responsible party and if so, the extent to which our client is entitled to fair compensation. To learn more about our experience in negligent operation or maintenance related matters, we invite you to contact the firm here.